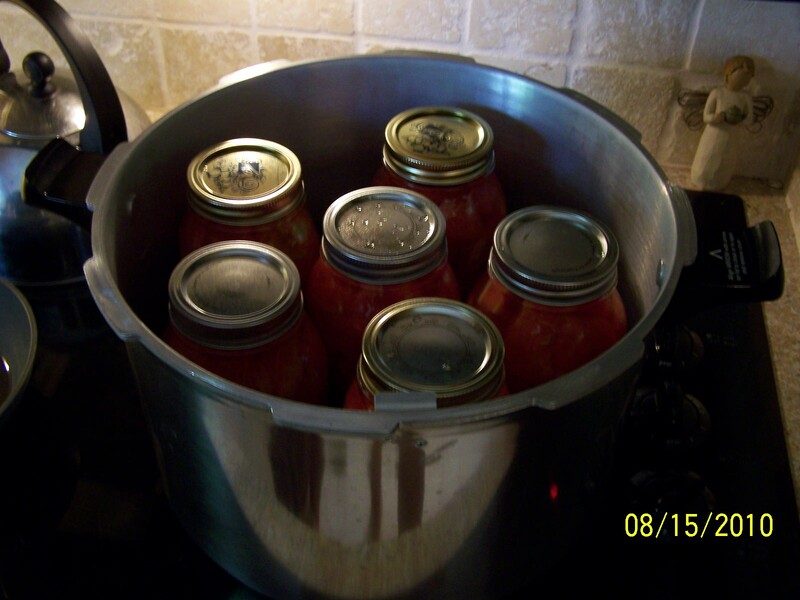 "It's canning day! 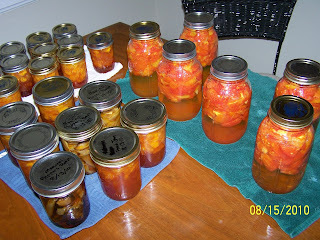 It's canning day!" That's what I excitedly said when I woke up Saturday morning. I knew it was going to be work, but I was excited nonetheless. Tom and the cats thought I was crazy. 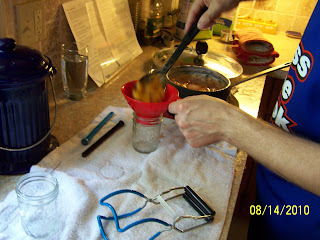 We started by sterilizing the jars. I love that we can use the dishwasher for this. 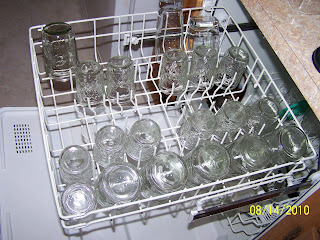 Not only does it clean the jars, it keeps them hot so they don't have to be in a pot of water on the stove waiting to be filled. 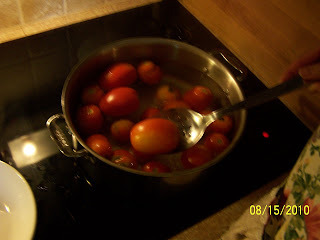 That frees up a burner on the stove for another use. Plus, it keeps the jars all tucked away until we're ready for them. We harvested all the mariachi peppers left on the plants, except for a few small ones, and any tomatoes that were ready to go. We decided to make peach jam to give as gifts so we bought 23 pounds of peaches from the Kings Drive Farmer's Market. We woke up bright and early Friday morning and headed to the market to buy fresh South Carolina peaches. 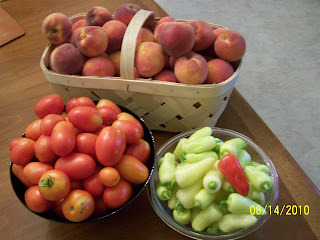 We also bought NC trout, NC blackberries, corn on the cob and onions. All for $25! 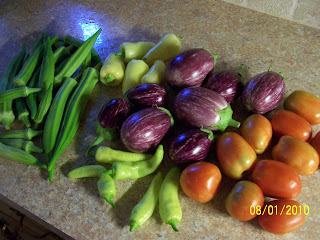 The tomatoes and peppers shown here are from TYs garden of course. 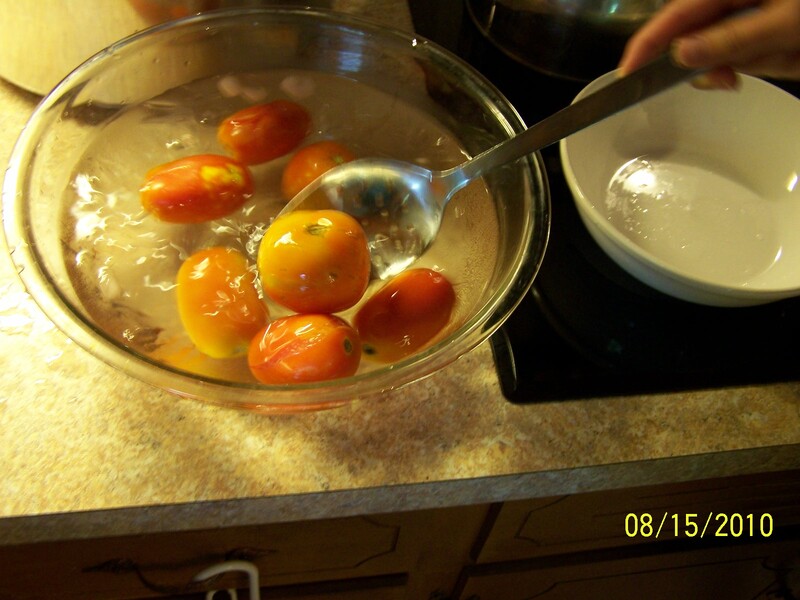 Then the preparation began. 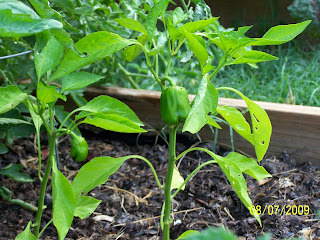 Tom de-seeded and de-veined the peppers. 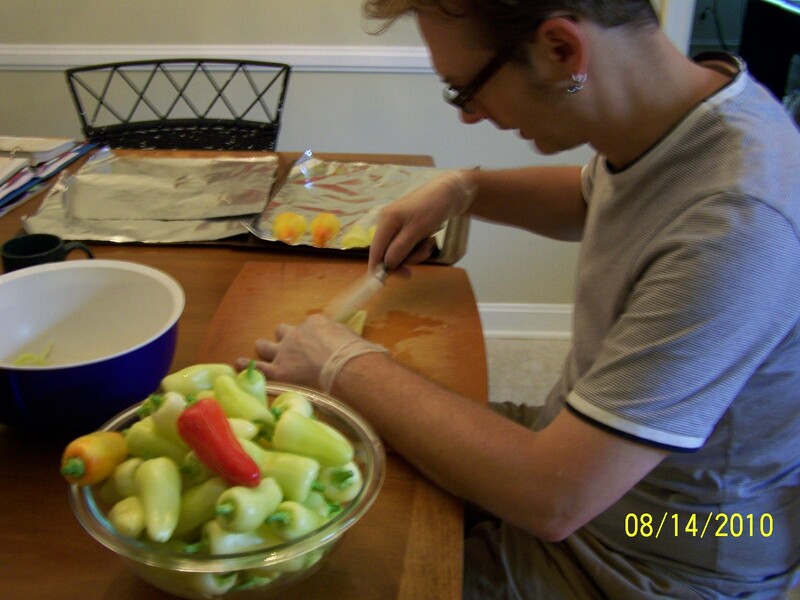 He made sure to wear gloves so his hands wouldn't absorb all that heat. then in ice water to make the skins easier to peel. 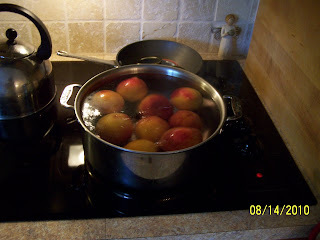 Once the skins were removed we diced them up and added lemon juice, pectin and sugar to make the peach jam. 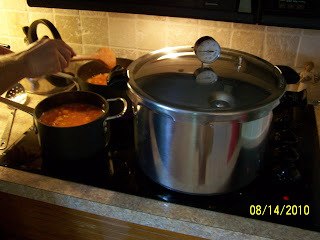 We made three batches in all. We took the clean, hot jars out of the dishwasher one by one and filled them up. 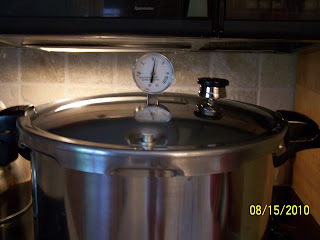 After a quick 10 minute water bath, the jam was done and lookin' purty. 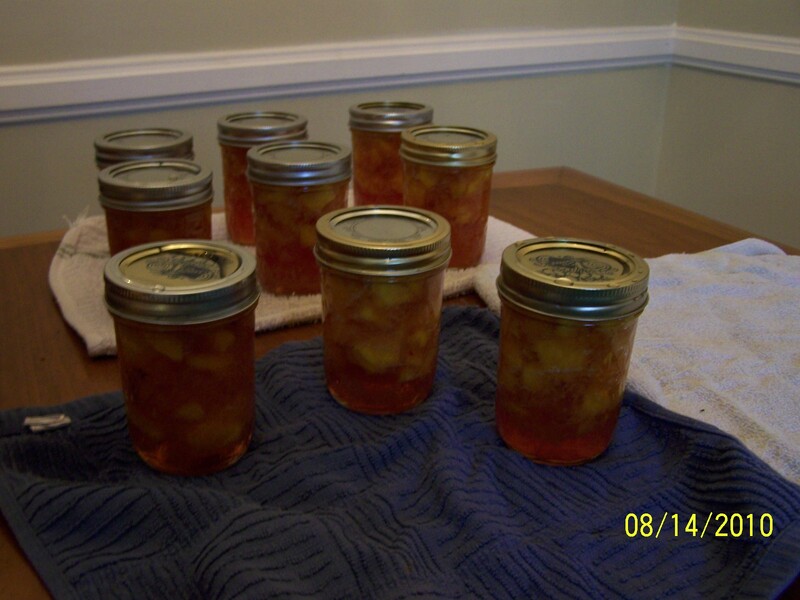 We used 10.5 pounds of peaches to make 12, 12oz jelly jars and 4 pint jars worth of peach jam. 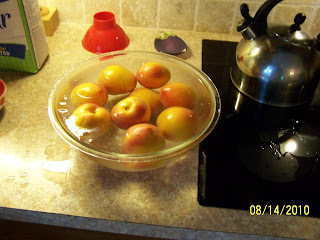 With the left over peaches I also made two peach/blackberry crisps and of course we ate a peach or two here and there. then a dunk into ice water to stop the cooking process. 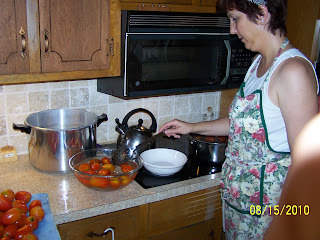 The two steps above sure made it easy to take the skins off all these tomatoes! 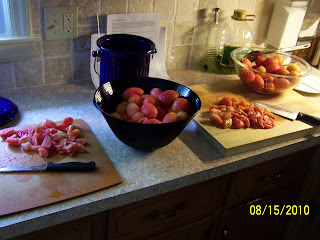 After taking the skins off, we cut the tomatoes into big chunks. 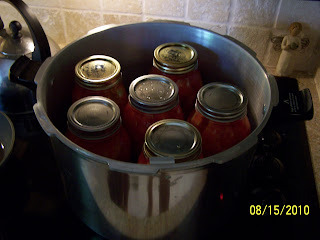 Canned them up and put them in the pressure canner. Once the pressure hit 11 pounds we started the timer and waited for the prescribed amount of time. This is the bounty that we created this weekend! 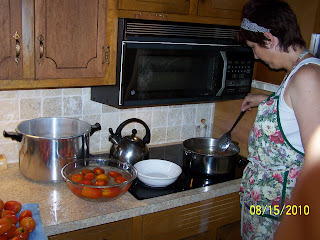 We ended up with 3 pints of roasted peppers and 6 quarts of tomatoes (plus the aforementioned peach jam). It certainly took a while to do, but we both really enjoyed ourselves. We kept thinking about what we will make this winter with our "put up" vegetables. It really will be a joy to use our own, home grown produce for soups and stews. The rainbow peppers are starting to make an appearance. I can't wait to cook with these for the first time. 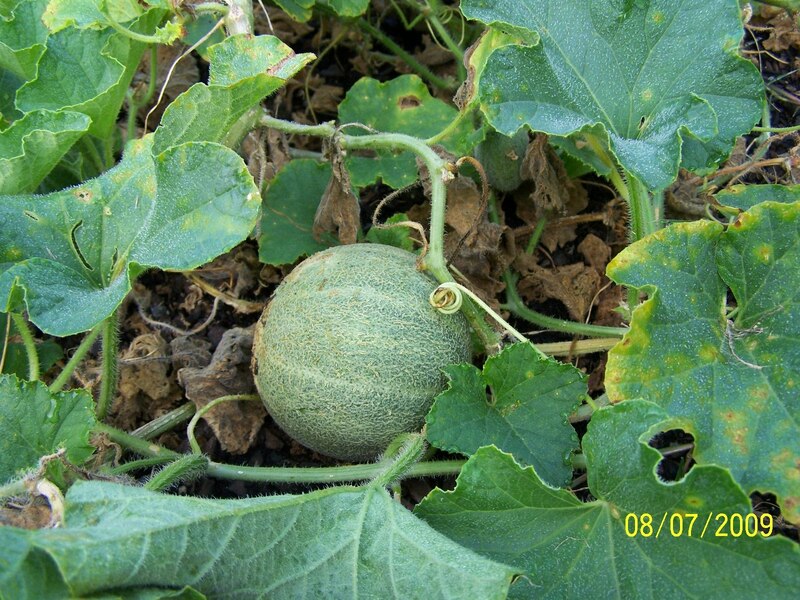 I'm pretty sure we'll hear "cha-ching" every time we pull one of these off the plant. That'd be the sound of money in our pockets. Up to $3 a pop for these guys in the grocery store. 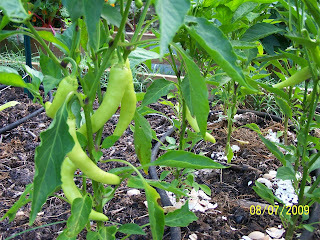 Banana peppers are coming in full force as well. They've been a good substitute for bell peppers in recipes that call for a half a bell pepper. 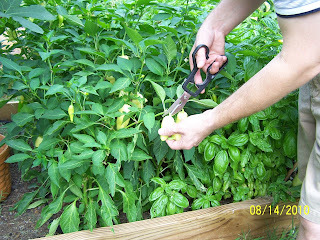 Two to four of these equal about a half a bell pepper. 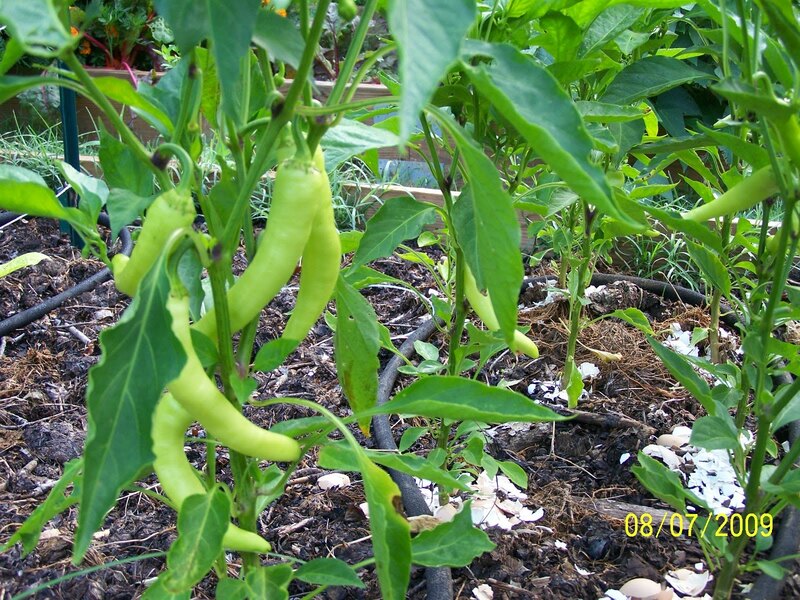 The mariachi peppers are turning beautiful colors. 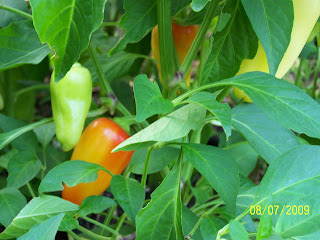 Tom found out that the longer these stay on the vine and the darker in color they get, the hotter they are. 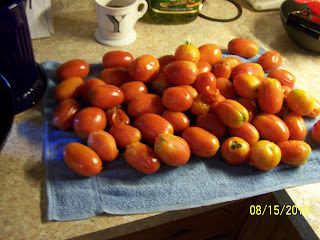 This coming weekend we'll harvest just about all of these, roast them in the oven, and do our first canning! We'll be sure to post lots of pictures of that process next week. 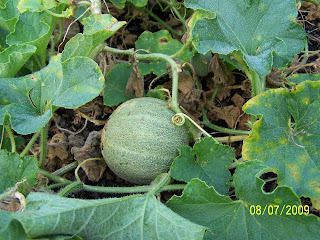 About three more cantaloupes have appeared! We heard the "cha-ching" sound when we harvested the three of these guys too. You can hear that sound very faintly when you walk by this new batch. 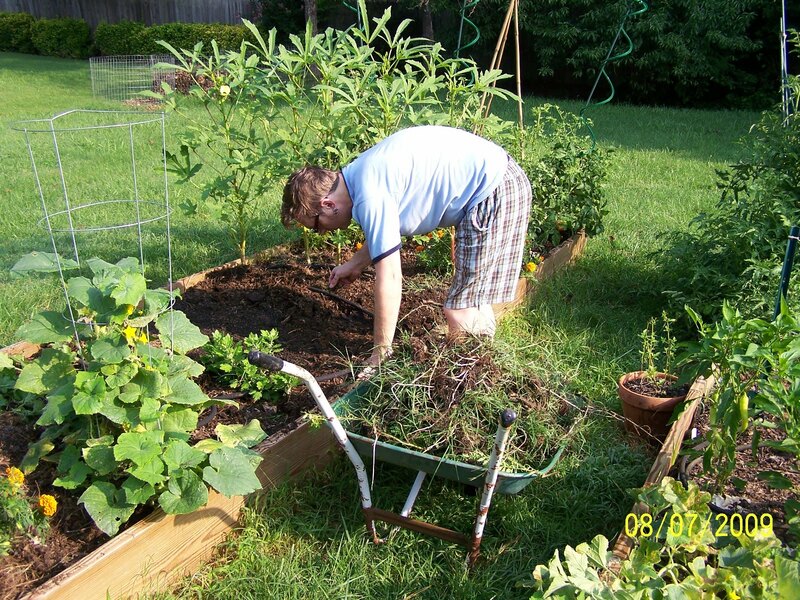 We began working our succession planting method and pulled out the last of the swiss chard and beets and planted fall carrot seeds. 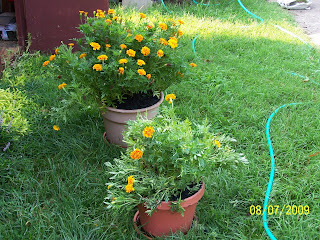 We also thinned out the marigolds and put big bunches of them in pots for our front porch. 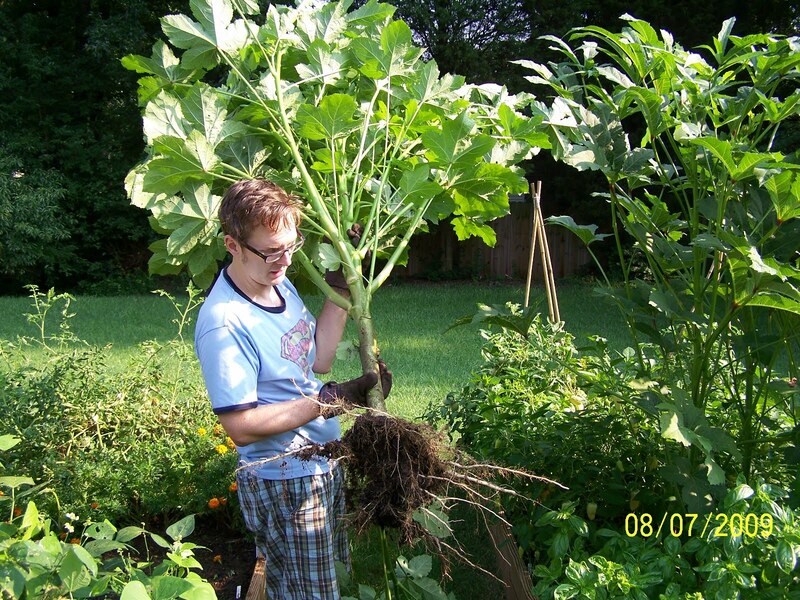 The okra is... well... lets just say this: They are producing, Tom is a happy camper, we've eaten a good bit, we've frozen a good bit, and there seems to be no end in sight. The plants are just about over our heads and will soon be at the point where we won't be able to reach the tops. 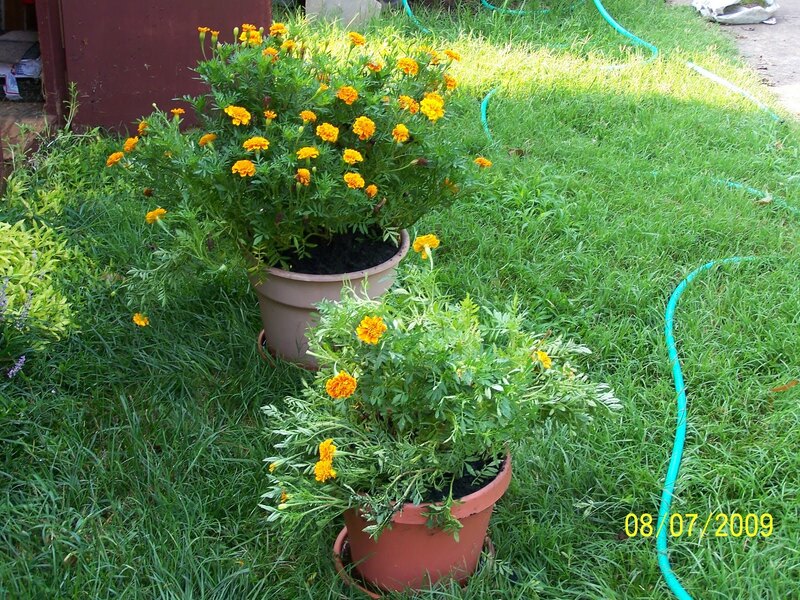 We have seven plants in one bed and about six in another. 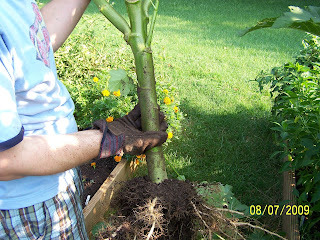 After a bit of "lively discussion" I convinced Tom to take out one of the plants that was starting to look more like a tree. In addition to choking out the rosemary, it was blocking the path between the beds. He pulled it out, but was none to happy about the thought of reducing the okra production. Can you believe we grew this tree-trunk of a plant from seed? He looks pretty grouchy, doesn't he? I think he's gotten over it now and realizes it was a good thing. 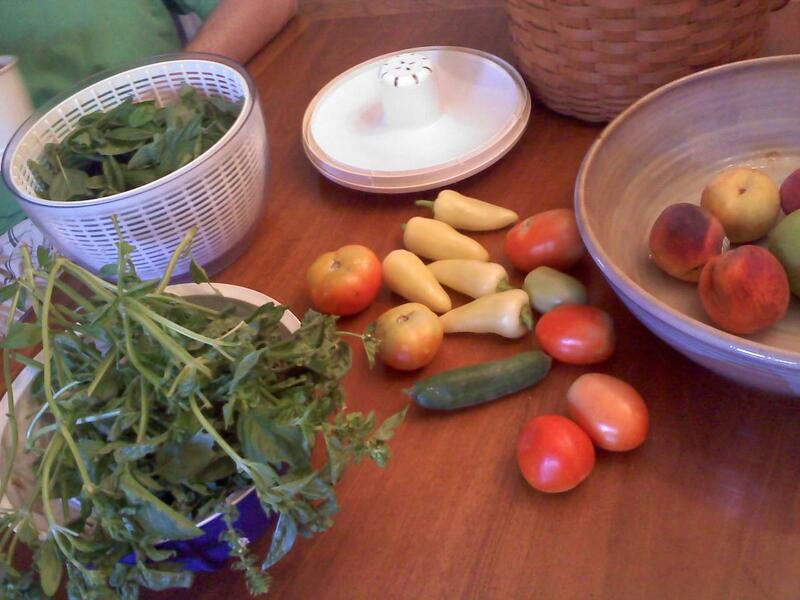 We finally had a few cucumbers come in and we also had some fellow gardeners give us some of their bounty. 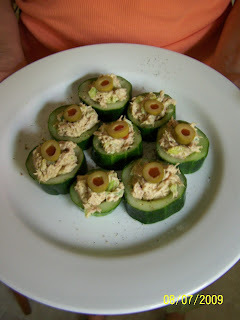 I found this cute recipe for something else to do with cucumbers in the Observer. Cut them into 3/4" rounds, scoop out the middle, make tuna salad with curry and a little sour cream, green onions, and peppers, load the tuna mixture into the scooped out part of the cucumber, top with a half an olive and cracked pepper. Yummy and fun! We had them for lunch yesterday. Sorry for the delay in writing. We've been busy eating. It's been two weeks since our last update. 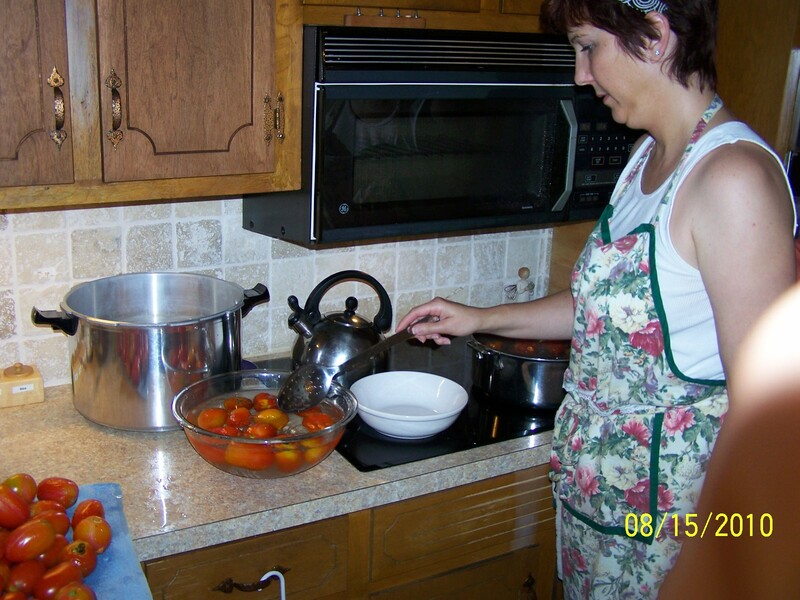 Aside from being busy bees in our daily lives, we've been busy working in TYsVeggiePatch. Just about every other day we perform one or all of the following tasks: weed, water, transplant, killing bugs, or harvest. 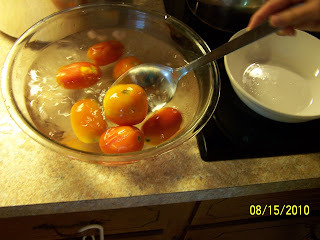 At long last, we have red tomatoes!! 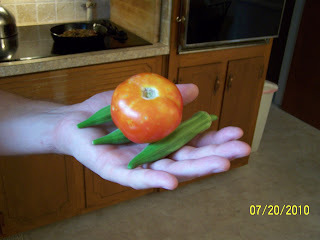 I believe this was our very first vine-ripened tomato and okra. Over the last two weeks, these next few pictures are good representations of what our kitchen has looked like. 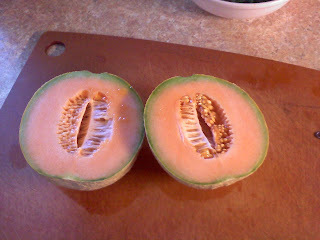 We ended up with three medium sized cantaloupes from our mystery plants. And boy were they yummy!